evric wrote: SSR: Futurlec SSRDC200V40A: Rated at 200Volts 40Amps(with heatsink) and the EV is running on 130V. Hmm. That's pretty tight. Is there a fair bit of wire from the element to the SSR? Tight? 200VDC rating on 130VDC system? About 0.5m from the SSR to the element. evric wrote: Tight? 200VDC rating on 130VDC system? No - I'm not criticising. All I'm saying is that if these elements are slightly inductive, MOSFETs really won't handle much more than their voltage rating and expire very quickly. A little back EMF over 200V and that's it. When I was doing my fan controllers for my ICE car (prototype of this heater controller but successful), I blew a 100V MOSFET off a 12V system before I added a reverse diode. The PTCs used as inrush limiting in many power supplies are the same technology to ceramic heater elements. See this paper section 6.2. It looks to me that the large parallel capacitance makes PWMing near impossible for all practical purposes. Well they are obviously usable at line frequency. As the Epcos document says. 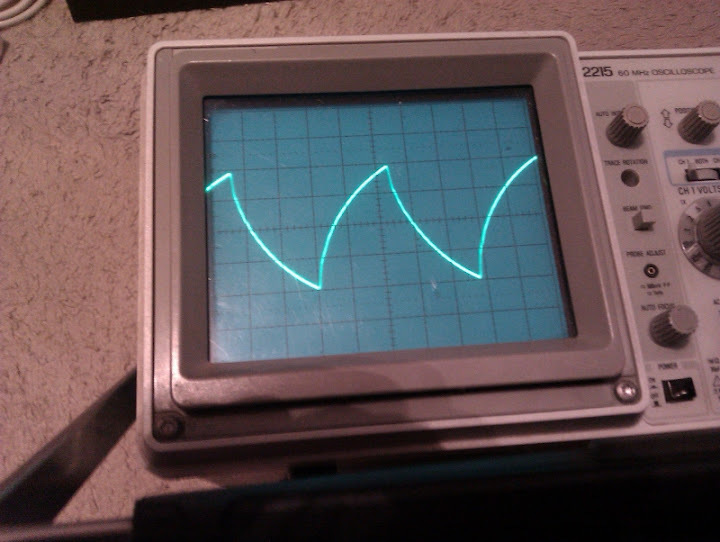 I had originally set up my PWM at 60Hz before I realised I didn't need it. In an AC situation I presume they could be PWMed with a zero crossing triac, with snubbing. One could get nostalgic for the old radiators with resistance wire on a ceramic cylinder. Good find, Johny. That Epcos app note. Gold. It has always seemed to me intuitively, like it might be pointless to PWM these things, because all that would happen is that they would pull more current in the on time and would tend to maintain almost the same temperature regardless, although there must of course be some low duty cycle threshold where the temp starts to plummet or you could never turn them off. As Regard says I would have been better off with an older style element. I'll try to characterise it AC wise over the next day or two and decide a strategy. Capacitive load hey... so, turn it into a proper buck converter with added output inductor, and switch faster (like 20kHz)? Edit: On further consideration, I don't see how a capacitive load could explain the blown freewheel diode as well as the IGBT. The load might have acted enough like a short circuit to damage the IGBT via overcurrent, but with a capacitive load the freewheel diode should have just stayed off the whole time..
Last edited by zeva on Mon, 24 Jun 2013, 14:57, edited 1 time in total. 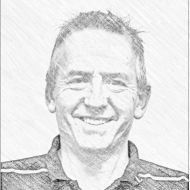 Johny wrote: I'll try to characterise it AC wise over the next day or two and decide a strategy. I think you're meant to control the heat with a variable fan. You need some fan (cooling) to keep it under the temperature where the resistance plummets (after the end of the positive resistance region). It will regulate its temperature within a narrow range, fairly independent of applied voltage (or effective voltage with PWM, and of course there are limits). But you can make it draw more current by increasing the cooling (running the fan harder, heating the cabin faster). Running the fan at minimum should keep the current down, and so the heating of the cabin down, and of course battery drain down. It's probably worth some sort of interlock to ensure that the fan is drawing current before enabling whatever turns on the ceramic heater, to avoid the resistance plummeting region. If the fan is not turning, it should draw excessive current and blow the fuse, which hopefully will ensure that the ceramic element doesn't get current with a bad fan for long. A fan controller should be pretty simple, and your car may have enough fixed settings (3 or 4) to be useful. Others have mentioned that they are usable at line frequency (50-60 Hz) and you are only driving at triple this. However, PWMing is inherently square waved, so there are harmonics up into the megahertz (depending on many factors). So it does seem that these are not great candidates for PWM control, as your thoughts seem to be leading to. Last edited by coulomb on Mon, 24 Jun 2013, 15:13, edited 1 time in total. zeva wrote: On further consideration, I don't see how a capacitive load could explain the blown freewheel diode as well as the IGBT. Yes, the diode shorting is a bit of a mystery. All I can think of is that if either the ceramic elements or the wiring has enough inductance, then layout becomes critical, as it is for any motor controller or similar. The veroboard layout would be adequate for a pure resistive load, I would imagine, but with the presence of an inductance, not so much. EVRic's experience seems to suggest that inductance is significant. Last edited by coulomb on Mon, 24 Jun 2013, 15:09, edited 1 time in total. coulomb wrote: I think you're meant to control the heat with a variable fan. I would have to ensure that the temperature limiting (Tmax) falls within my physical structures ability to safely contain it. The Vogue only has 2 speeds and I had previously determined that the element drew about 2A on fan low and 3A on fan high. I could simply convert my PWM system into a high side P-channel MOSFET and control the fan with a preset minimum. I still haven't given up on PWMing the element because it really did work well for that short time. I have measured capacitance at 20nF cold and 30nF hot (heat gun). The machine we have here could only measure ESR at 1kHz and 10kHz and that was respectively 420 Ohms and 330 Ohms (not terribly useful in comparing with a switching system). 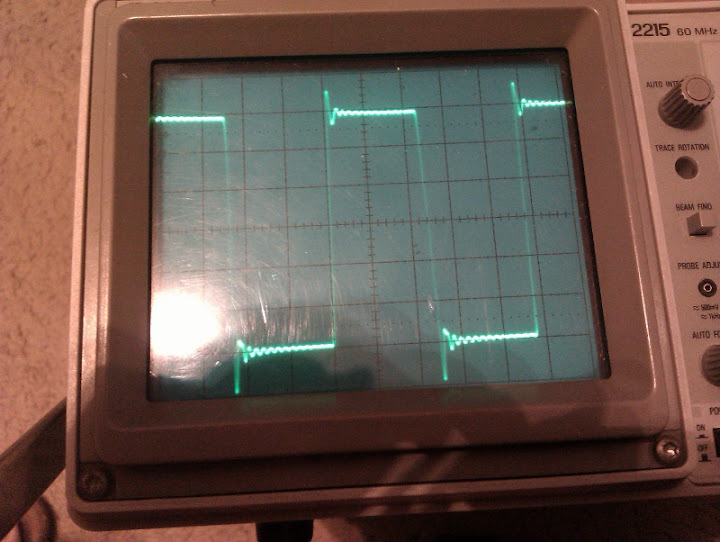 I will use a square wave at home and better characterise the series resistance. My current plan is to try limiting the switching current to the repetitive rating of the IGBT. I can do this with two 50W 5.6 Ohm resistors but by the time I cram them into the heater box it's getting silly. Typical PTC temperature/resistance response. Airflow should hold it somewhere near Tc. zeva wrote: Edit: On further consideration, I don't see how a capacitive load could explain the blown freewheel diode as well as the IGBT. The load might have acted enough like a short circuit to damage the IGBT via overcurrent, but with a capacitive load the freewheel diode should have just stayed off the whole time.. Sorry I meant to follow up your comment Ian. Yeah - weird. May be a resonance thing with 400mm of wire to each end of the element. At 10 Ohms gate drive the IGBT I was using switches Td(on) 30nS, Td(off) 160nS. (I know - too fast!). Its only a heater, so could you PWM with a frequency of say .5 HZ? 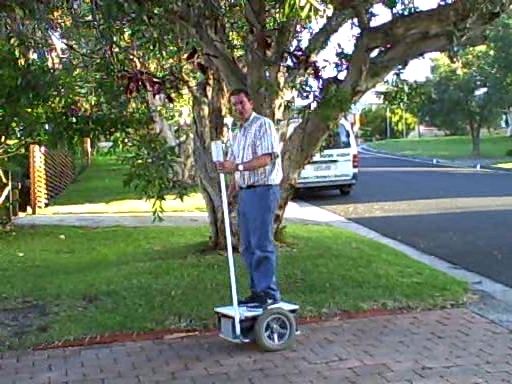 Might still have to knock the sharp edges of the rise and fall times. a4x4kiwi wrote: Its only a heater, so could you PWM with a frequency of say .5 HZ? I could switch a lot slower but there is a reason I don't really want to. I would not be able to easily read the heater current on my dash. Since it must be the repetitive high current that is cooking the IGBT internally I need to try to figure what switching rate is acceptable - also what switching time would help (300nS, 1uS etc). My dashboard's battery current integration is around 300mS so switching above 20Hz is preferable. 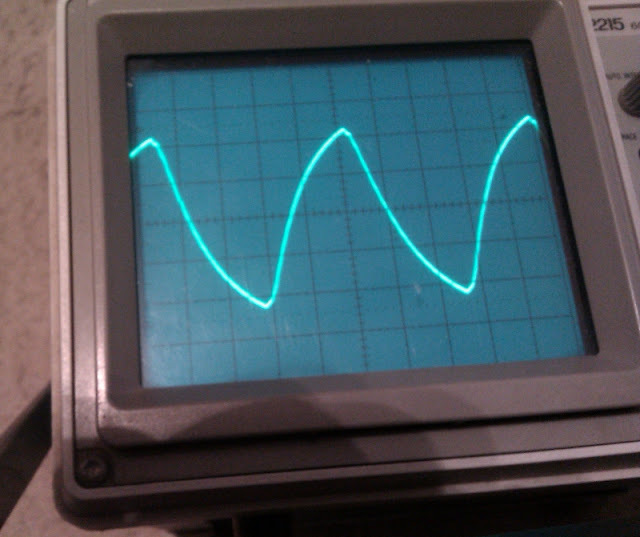 - Signal Generator set to 1MHz (sightly higher) - 50 Ohm output impedance. - 60MHz CRO. Sweep set to 0.2uS/cm, vertical set to 500mV/cm. 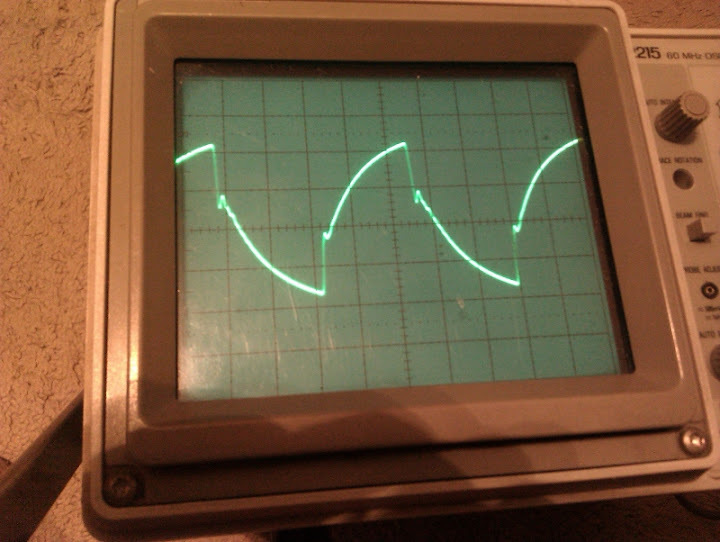 In every case the waveform is being measured at the signal generator output - not the element. This matters for the pictures with the 11.2 Ohm series resistance. Essentially I'm increasing the ESR of the element to measure the effect. Reminder: The element measured 20nF capacitance at 20deg C.
There was no substantial change in waveforms when the element was heated. And for comparison to a real 10nF capacitor. I conclude from this that the element has an ESR at 1MHz of about 33 Ohms. Last edited by Johny on Wed, 26 Jun 2013, 07:01, edited 1 time in total. 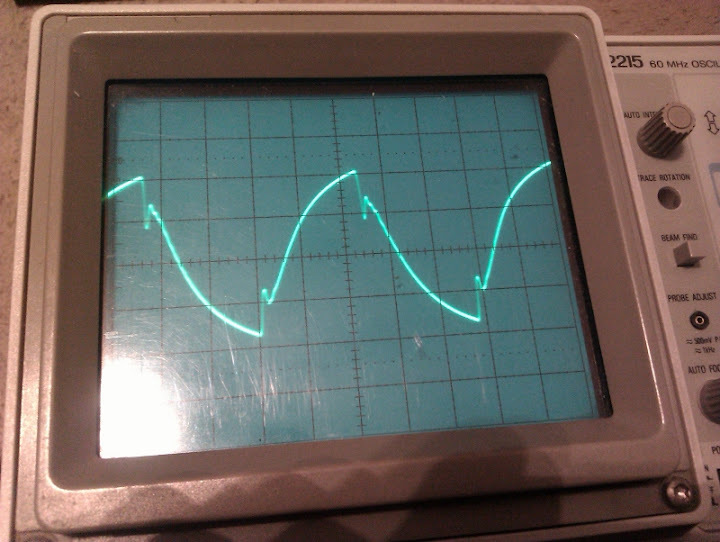 The reverse diode failure has been a sticking point for trying the PWM heater control again. Why did it fail? I have a theory on why the fast recovery diode failed - and indeed why the IGBT failed as well. The diode I'm using in an RHRP15120. 15A and 1200V. The specs indicate recovery time of 65 to 75nS. The IGBT was an HGTG10N120BN. The current rating was sufficient for the ESR calculated (above post), but with a 10 Ohm gate resistor, the turn on delay time is 23nS and Current rise time 11nS. All up about twice as fast as the diode. So the diode may well have been conducting when the IGBT turned on again. The PWM isn't software controlled, the TL494 PWM chip is an analogue ramp and comparator system. So the pulse widths can be very short. That, and the load being somewhat capacitive, not alltogether inductive and we at least have a reason. So I'll try again. This time a slightly bigger IGBT (because of have four of them) an HGTG27N120BN, and I'll use a 100 Ohm gate resistor. Unfortunately the specs don't give a graph on gate resistor vs switching times but I'm estimating from other IGBT data sheets. I have one more put-the-heater-in, pull-the-heater-out left in me for this winter. This is what alerted me to the relationship between IGBT switching times and diode recovery time. The switching behaviour of the free-wheeling diode is also affected by the gate resistor and limits the minimum value of the gate resistance. This means that the turn-on switching speed of the IGBT can be only increased up to a level compatible with the reverse recovery behaviour of the free-wheeling diode being used. A decrease in the gate resistor increases not only the overvoltage stress on the IGBT, but also on the free-wheeling diodes caused by the increased diC/dt. 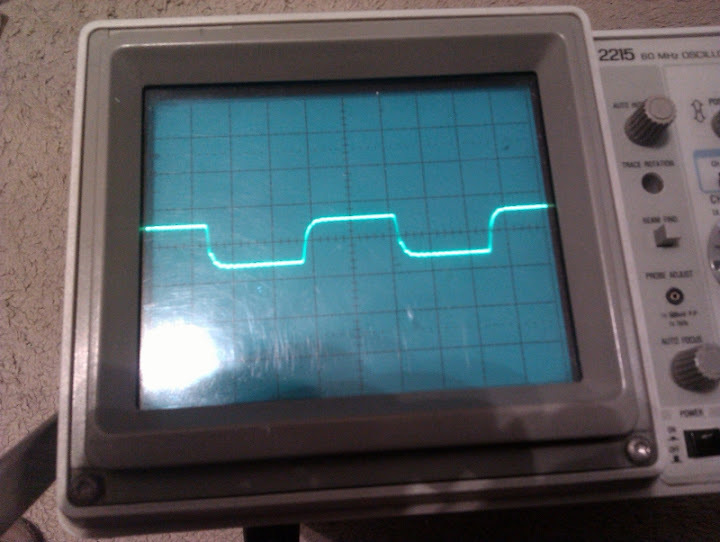 Based on your switching being 110Hz and the relatively low inductance of a heater element, I was thinking the diode wouldn't remain in conduction mode for the duration of the off time - more likely just circulating a brief inductive pulse then turning off - which had me thinking shoot-through was unlikely. But I guess you would have that point of say 99% duty cycle where the off-time is so short that the diode *is* still conducting when the IGBT turns on. Ironically the HGTG27N120BN appears to have almost 3x bigger gate charge, which could slow down switching enough to solve the problem even with a 10ohm gate resistor.. And even with the old IGBT a 100ohm gate is probably higher than you need.. But at 110Hz switching frequency your switching losses are going to be insignificant either way, so optimising efficiency probably isn't a high priority and slow switching should be nice and safe! Last edited by zeva on Wed, 26 Jun 2013, 09:31, edited 1 time in total. Thanks for taking the time to look into that Ian. The ESR and capacitive effect of the element may also hold the diode on longer (IMO). I think I'll go with 100 Ohms. Unfortunately I have run out of 8D20 NTCs to put in series with the supply as they both suffered as a result of the failures so the heater may have to wait until I get some. Meanwhile I'll clean up the board, check for excessive leakage/damage and get it going again - or make another one on epoxy PCB. I did an experiment on the ceramic element last night. I fed it with 60VDC from one of my spare chargers. I fed into the centre tap I had left for this purpose and the two ends connected together. That would be the 240 VAC original connections for high power - 1500W. A bit later it reached 2.5A - temp 180degC. A bit later it hit the maximum of 2.67A, temp 210degC. Then, about 1 miunute later as I watched, the current reduced to 2.5Amps again as the temp got to around 215degC. I shut it off as something was smelling a bit. So the Curie (no Tmax) temperature of this typical 1500W ceramic heater is around 210degC. Useful to know that the Red RTV 350degC silicone will hold it if the fan fails and my safeties don't work. The nose will pick it up (the paint where the elements supports anchor to the heater box got whiffy). Last edited by Johny on Wed, 07 May 2014, 11:55, edited 1 time in total. Just read the entire blog and conversion thread......Top work mate! Was a little dubious about the electronic dash conversion but it's worked out pretty well..
You're getting decent regen too....AC is the future! Well the tailshaft is back in the car. The balancing folk identified that the spigot on the front flange of the tailshaft and the "cup" in the coupler did not perfectly match. To quote Jeff, "any movement is too much". They changed the flange on the front of the tailshaft then balanced the whole lot together. The front flange holes now comfortably took M10 bolts (buthering gone). It's a lot better - but it's still not perfect. At 90 km/h on the tollway it wasn't scary - but it wasn't comfortable either - still a lot of tailshaft speed vibration. I didn't put it on stands to test it as I had very little time, but I hope to do an axle stand test maybe be next weekend. 1. Record the vibration audio again just because I am not sure that it's vibrating at tailshaft speed - it feels double that. 2. Try my SS hoseclamp at 45deg increments. 3. Try dampening out the front motor cradle (with my hands) and see how much that is contributing. Great to hear the vibration issue is a lot better, although it's a shame it's still not 100% to your liking though. I have suspected for a week or so that my remaining vibration is of a higher frequency than before. So I did an audio recording on my phone (for some reason the audio recorder doesn't high-pass filter the Mic - which is great for me) from inside the cabin at exactly 60 km/h - that would be a rotation frequency of 40 Hz in my car. 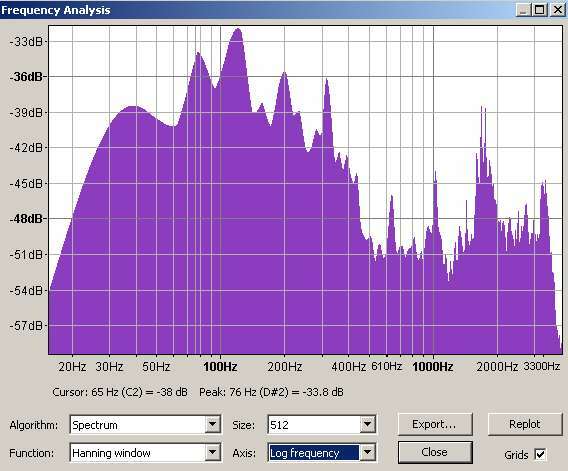 An unbalanced tailshaft should show 40 Hz - instead it's 80 Hz - and VERY clear about it. 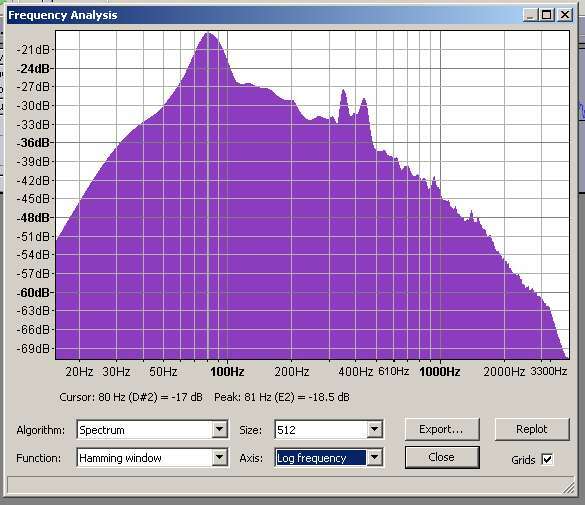 Here is a frequency analysis. Compare that to a previous recording when the balance was a lot worse - also done with my phone where the first peak was obvious at 37 Hz(slightly slower speed). So could it be that this is the best I will get because the vibration is at twice tailshaft speed and is therefore caused by the UJs??? ?